When I was a kid, I used to spend hours helping my grandfather with home-maintenance projects. During these tasks, he would often say, "Half the solution to any job is having the right tools." Imagine trying to hook up the plumbing for a bathroom sink. You can spend an hour scraping your knuckles and cursing if you try to do it with a simple set of pliers. But break out a plumber's wrench, with its long neck and angled head, and you can hook up those pipes in a matter of minutes. That's exactly how I feel about investing as well. And to me, one of the most valuable tools in any investor's tool kit is a basic understanding of corporate financial statements. Today, I'll share the three key tools you need to judge a company's financials. You'll save time and effort... And you'll learn to avoid big-name companies that are secretly doomed to underperform. So what are the key tools? Among the three main financial statements, this one gives a snapshot of a company. It shows what a company owns (assets), what it owes (liabilities), and the difference between those two numbers (net equity). All else equal, you'd want to invest in a company with a larger asset base, fewer liabilities, and, therefore, a greater net equity value. The balance sheet is sometimes called the "stock" statement, in that it takes stock of what a company owns and owes at a moment in time. It tells you how much business a company generated (its revenues) and subtracts from this what the company spent (its expenses). The net result is its profits, or net income. Again, all else equal, you'd prefer to invest in a company with higher revenues, lower expenses, and, therefore, higher profits (and a higher profit margin). However, many investors miss one key nuance about the income statement. Many of its line items are smoothed out (or shown on an "accrual" basis), rather than shown on a true cash basis. This is partly to account for large, lumpy items that may not occur every period but represent an ongoing part of the business. For instance, consider a software company that sells three-year licenses to its software. It gets the cash up front, but it provides services (and incurs expenses) over the course of those next three years. If the company recorded all the revenues in year one, this would overstate ongoing profits in that year, and then understate profits in years two and three. So instead, the income statement books the revenues in the period in which it's earned, not when the cash is received. Smoothing this and other lumpy items out allows us to compare a company's performance from period to period. As investors, we want to see not only how well a company performed this year, but also how that compares with previous years. For example, look at tech companies Xerox (XRX) and Nvidia (NVDA). Both companies booked roughly $10 billion in revenues last year. But Nvidia's market capitalization is more than 20 times larger than that of Xerox. Much of that is due to Nvidia's 40%-plus revenue growth, versus Xerox's 5% revenue decline last year. Many investors overlook this third statement, but at Stansberry Research, we consider it "mission critical." That's because the cash flow statement shows how much actual cash a company generated over a given period. Of course, numbers might jump around from year to year – for example, if a company spends a lot one year on a new factory and nothing the next year. But at the end of the day, the more cash a business generates over time, the more valuable the company is. The statement of cash flows is also the quickest and best way to determine a company's free cash flow ("FCF"). Free cash flow is what's left after the company pays for all expenses and outlays. That makes it a great measure of the excess cash a company generates... which it can use to enrich shareholders through dividends and buybacks, or to invest in growth. When you want to calculate a company's FCF, go to the statement of cash flows. Take the "net cash from operating activities" and subtract the capital expenditures. Again, the higher this number (and the higher FCF as a percent of revenues), the better, all else equal. Print out this "cheat sheet" summary of the three financial statements to have at your side as you go through the numbers. It won't happen overnight, but a better understanding of these financial statements will be a valuable addition to your investing tool kit. You'll have a better perspective on how a business operates. And this deeper level of understanding should help you ultimately make better investment decisions, particularly in times of heightened market fear or greed. "To be a great investor, all you have to know is how to identify these kinds of investments," Porter Stansberry writes. Learn more about a key financial trait that allows businesses to grow earnings steadily over time, right here: Why I Lost Interest in Deep Value Investing. As an investor, you want to own high-quality businesses that can withstand harsh market conditions. And as Dan Ferris explains, one type of business can actually get stronger during hard times... Read more here: How to Find Stocks That Thrive in a Bear Market. SodaStream (SODA) sells kitchen appliances and flavor mixes, so you can turn tap water into sparkling water with the touch of a button. 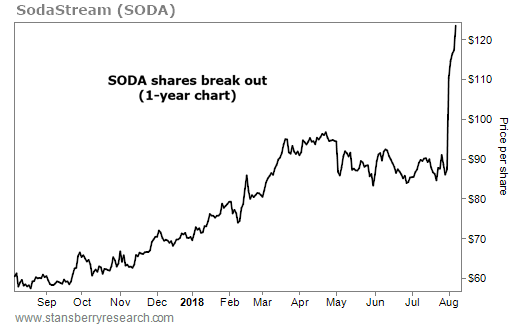 With more folks looking for alternatives to sugary drinks, SodaStream has added 2.5 million users from 2015 to 2017. It now serves about 12.5 million people worldwide. And the company just reported its best quarter yet… Sales jumped to $171.5 million, a 31% increase from the same quarter last year.